The comparisons to Isabel were made by many during the days preceding the arrival of Hurricane Isabel. 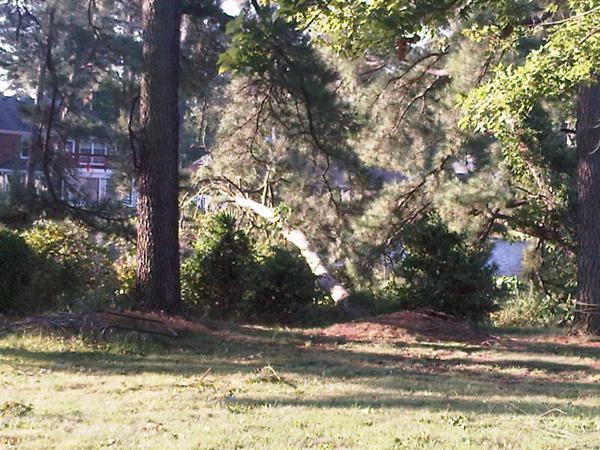 In that storm, I lost eight trees on my roughly one acre lot. The ground was so saturated from the rain that they literally came up by the roots. This year, I only lost one, down at the water’s edge. My neighbor wasn’t so lucky. As you can see from the photo (click to enlarge), their home is almost obscured by the branches of the tree. 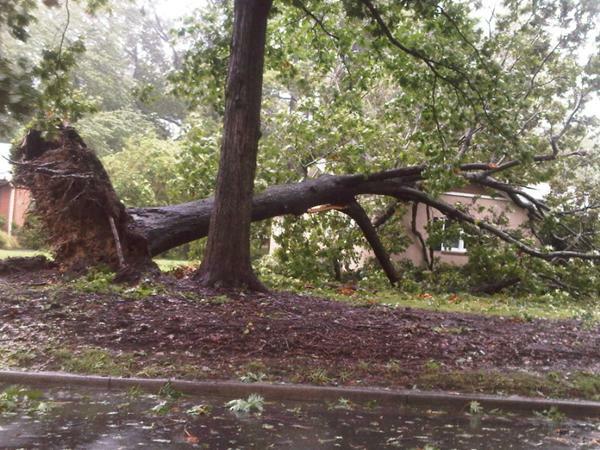 I can definitely relate: one of the 8 trees I lost in 2003 – an 80 foot pecan – landed on my house. And while I lost power both times, this time I was out for a shorter period. I was outside cleaning up storm debris when the power, which went out around 4 Saturday, came back on, a little before 11am this morning. Having witnessed both, Irene was not nearly as bad as Isabel was. Lake Whitehurst didn’t come nearly as far up in my yard as it did then. And the wind was not as bad. Nevertheless, a hurricane is nothing to play with. I’m grateful to not live in Hatteras, where the road has been washed out, leaving hundreds stranded. Eighteen people lost their lives in this storm, including four in Virginia. My thoughts and prayers to those still dealing with the affects of Irene. Looks like the death toll is up to 24 now. I’ll have to see how soon my power comes back on this time to say which was worse. Five days for Isabel. I went out at Saturday at 3 p.m….before the wind in Richmond actually got bad…..I’m still out as of now. We’re operating on emergency power at work. I got very lucky with this storm; the power was only out for a couple of minutes, and one largish tree limb fell behind the house. My power was out for a week after Isabel, despite the fact that blocks all around our house got theirs back in a day or so. What I found out then was that my grid section has so few houses that it sits near the bottom of Dominion’s priority list. Randy, I’m afraid that may be true of my new house as well. I met my next door neighbor yesterday while cleaning up the yard. He said they were out 21 days for Isabel. The infuriating thing is that the houses on the other side of the street are on the same grid sector as St. Mary’s hospital and had power back within an hour of it going out. And the death toll is now 40. I’m still out of power and Dominion doesn’t expect to get us back online today either. I just lost two freezers full of meat that I bought two weeks ago. So, at least finacially, this is now much worse than Isabel to me. Wow. That’s not good. Hope you get power soon.